The very first recordings by the BLEU FOREST happened after they played a show at the "Hey You Coffeehouse" in Ventura, CA. Jimmie Haskell decided to have them come to Hollywood and record on the spot at his place. His intention was to capture how the band sounded live, and this is what you get in Ichiban: Two mics, the band, a recording machine, no retakes, spontaneity and raw energy, a time-capsule direct From Jimmie's place in 1967. The sound and the style reminiscent of what was happening in San Francisco around 1966/1967 is captured in these recordings. 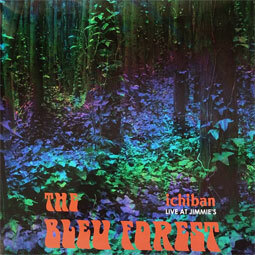 ichiban mirros the pinnacle days at Haight-Ashbury, echoes of the summer of love, "Turn on, tune in, drop out"! Available for the first time on Vinyl through Golden Pavilion records and on CD through Gear Fab records. Limited to 400 copies on black vinyl and 100 copies on marbled green & blue vinyl. Comes in gatefold cover, including unseen pictures, back story and lyrics.